Visit MotoSport online at MotoSport.com for a wide range of aftermarket parts, apparel and accessories for Motocross and Harley-Davidson enthusiasts. Along with many of the top brands, they also carry a large selection of Honda & Kawasaki OEM parts. Save on your next purchase with MotoSport discounts, MotoSport Coupons, MotoSport promotions and MotoSport savings found here on 58Coupons.com. 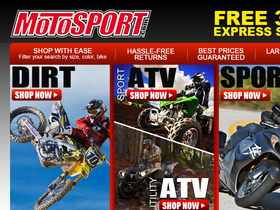 When you spend over $99 or more on MotoSport.com, you'll qualify for Free 3-day Shipping. Save up to 50% on clearance items from MotoSport.com. Hurry, quantities are limited. Shop MotorSport.com today and save up to 35% on apparel. Click link to view the selection. Sign up for the rewards program on MotoSport.com and you can earn up to 15% back with every order.